Mobile app outsourcing with years of experience has developed deep expertise and a client-driven approach, also we provide end-to-end mobile app development solutions. Our team has an overriding commitment to deliver quality Mobile application development with engaging UI/UX. Our approach is client driven and we interact with them to facilitate excellent solutions. Our expertise lies in building Android and iOS applications supported by a strong cloud based backend infrastructure. Our application development philosophy is driven to enhance the user experience. Our Mobile strategies can create added value to benefit businesses and consumers. 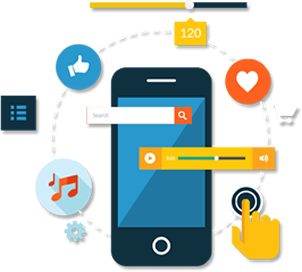 Mobile App outsourcing ANGLER’s flag-ship service that delivers value to customers by utilizing a blend of technologies, we develop the best in class mobile apps that makes your solution offerings accessible anytime and from anywhere. Our highly innovative and customized app development services have profited many clients by enabling them to boost real-time access, critical business information, reach maximum number of potential customers in the least amount of time. As an award winning mobile app development and outsourcing service provider our solutions are feature- rich, cost- effective and client-centric with highly focused design architecture for iPhone, iPad, Android and Windows apps focusing all kinds of businesses. We create long-term value for our clients by identifying both risk, and opportunities in the marketplace. Allow us to address your long-term changes or long-term challenges, and watch your business grow as a result.